Add a rich, sophisticated look to your bath. Our Coastal Sands natural granite vanity top includes 2 white porcelain undermount sinks and a matching back splash. Coverage for all natural granite vanity tops lasts from 3 years from the original date of purchase. For more information please call 1-855-995-5578. Heritage Baths exceptional Mohave Beige granite vanity top will add the finishing touch to your bathroom. The natural beauty of stone coupled with its durable, lasting appeal will bring luxurious style to any vanity. The durable top has a penetrating sealer that protects against stains by blocking pores and small cracks in the stone. Two pre-attached, Grade A Vitreous China bowls, matching 4" backsplash and sidesplash are included, along with drillings for an 8 center faucet. The top is finished off with a meticulously cut Ogee edge detail around the sink and across the front for timeless appeal. Coastal Sands 61-inch W Natural Granite Vanity Top Add a rich, sophisticated look to your bath. Our Coastal Sands natural granite vanity top includes 2 white porcelain undermount sinks and a matching back splash. 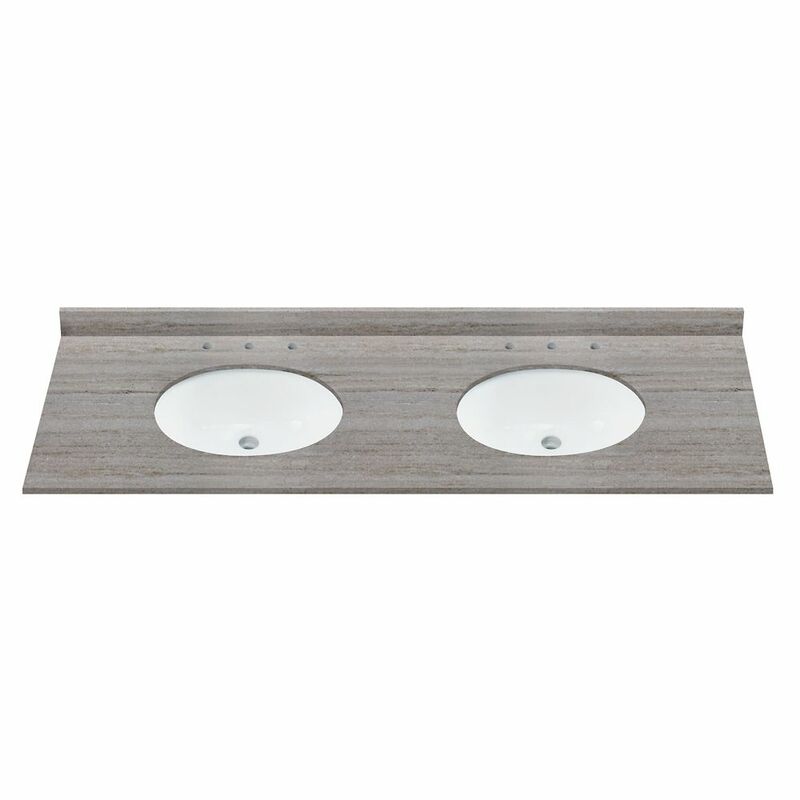 Coastal Sands 61-inch W Natural Granite Vanity Top is rated 3.0 out of 5 by 2. Rated 4 out of 5 by gregL from Marble? Very nice vanity top, beautiful colours through out. However, I believe the vanity stone is not Granite as stated but it is a Palisandro Marble. We found Palisandro Marble tiles that are an exact match for the top. I would give this top 5 stars but the description appears to be incorrect. Rated 2 out of 5 by Gman from Arrived with 4" faucet holes not 8" Ordered online. Arrived with pre-drilled for 4" faucets not 8" as stated in the description and reflected in the photos. What is the actual width of this countertop. the title say 61 in and the specs say 64.17.